Explanation: In this colorful mosaic, filaments of gas and dust span some 9 degrees across central Cygnus, a nebula rich constellation along the northern Milky Way. 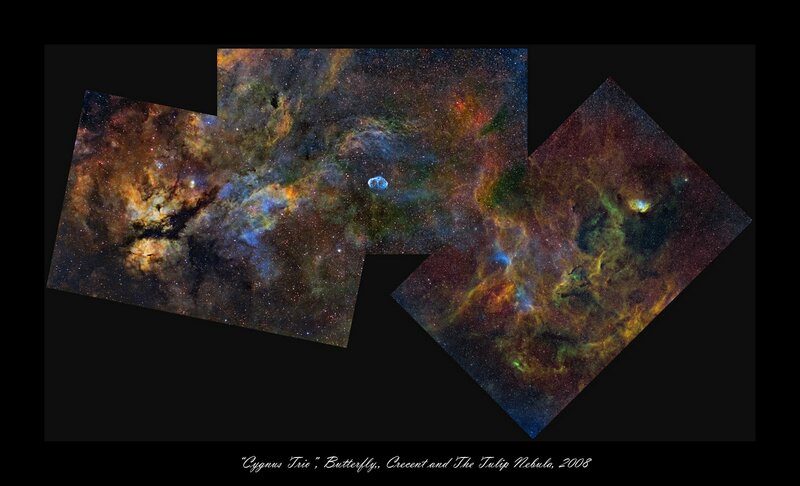 A trio of nebulae with popular names highlights the beautiful skyscape - the Butterfly, the Crescent, and the Tulip. At left, the Butterfly Nebula (IC 1318), lies near bright star Gamma Cygni. The Butterfly's expansive, glowing, wing-shaped gas clouds are divided by a dark dust lane. Near center, the Crescent Nebula (NGC 6888) is more compact, a cosmic bubble with a bright edge blown by winds from a massive Wolf-Rayet star. On the right is the Tulip Nebula (Sh2-101), a small emission region shaped like a blossoming flower viewed from the side. All are within a few thousand light-years of the Sun in the Orion spiral arm of our galaxy. The gorgeous mosaic is presented in false color, constructed from image data recorded through narrow band filters. The range of colors was created by a mapping of emission from hydrogen, sulfur and oxygen atoms in the nebula to red, green, and blue hues. Take a survey on Aesthetics and Astronomy.